Taking their name from Michael J.Fox’s character, Marty McFly, in the “Back to the Future” movie trilogy, McFly band consists of Danny Jones (guitar/vocals), Tom Fletcher (guitar/vocals), Dougie Poynter (bass, vocals) and Harry Judd (drums). This compilation album showcases their awesome music talent at such young age (ranging from 18-20). This group of young men pen their own songs and play their own instruments. No wonder they won the Best Pop award at the Brits awards in 2005. The 1st song “Five Colours In Her Hair” in the album was formerly a single that entered the UK charts at No. 1 back in April 2004 and stayed there for 2 weeks. It's a mix of funky rock and a tinge of Beatles-feel with a catchy chorus” Doo doo do do doo doooo…”! It will definitely pricked up the listeners' ears immediately. “Obviously” is their 2nd single. And obviously, it is going to enthrall the listener further. Exceptionally memorable is the No.6 song “All About You” with its soft orchestral beginning that revels with marvelous rhythms. 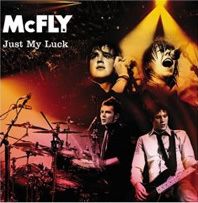 “Just My Luck” is also the title song for the romance comedy of the same name that starred Lindsay Lohan and McFly as themselves. And the album ends timely with “Memory Lane”. McFly scored with its simple, nice lyrics and funky upbeat melody. And they really sing well. A highly enjoyable album.